WOW! what a drive, today we saw so many whild animals. A single (not sure if it was married) Bison right outside Liard Lodge. As soon as we got on the road, a herd of bison, they were huge, than we saw a back bear, another one, another heard of bison but this time I got a bit too excited, just as I was driving very slowly with the solar car a mama bison got its cuf moving and running. I brought the solar car to a stop, waited until most of the herd crossed the road before turning the wheels again. It was so cool to get that close to them. Following that I had another encouter with another black bear. Far enough to be at a safe distance but close enough to get some great photos. The drive it self was a bit challenging due to the weather. The clear sky morning turned into overcast and rain. Early in the morning we had the car charging at the back of the Liard Hot Springs while replacing tires, got new tires from underneath the trailer (our secret solar car tire location), organize tools, etc.. Laura was back on her feet, up and running. From the hot springs we made a stop at the Liard Lodge, I was looking forward to seeing Richard but he is no longer there. Florence, the new manager, allowed me to use their faz machine, to send agreement to 20/20 it airs tomorrow. Florence also adopted 20 miles. Thank you Florence. We stay in Liard until the early afternoon. After chocolate ice cream and meeting a couple vans full of Norh Carolinans, we head out. Josh gets a close up with a black bear. We see more buffalo and some cute little foxes. In the back we work on updates to perfect the website to upload once we reach Watson Lake. The views get increasingly beautiful as the landscape becomes more and more remote. However, whenever the crew lines up a good shot, a car always seems to come by to spoil the photo. Willy makes his own lasting fragrance for the rest of the van to enjoy, and we gasp for fresh air, even though it is clouded with mosquitos. We end up driving until 1am, stop at the border of Yukon Territory and for the first time in a while, I lay my head to rest in dark skies. A rainbow around the sun! Watch out for falling rock! Why did the black bear cross the road? 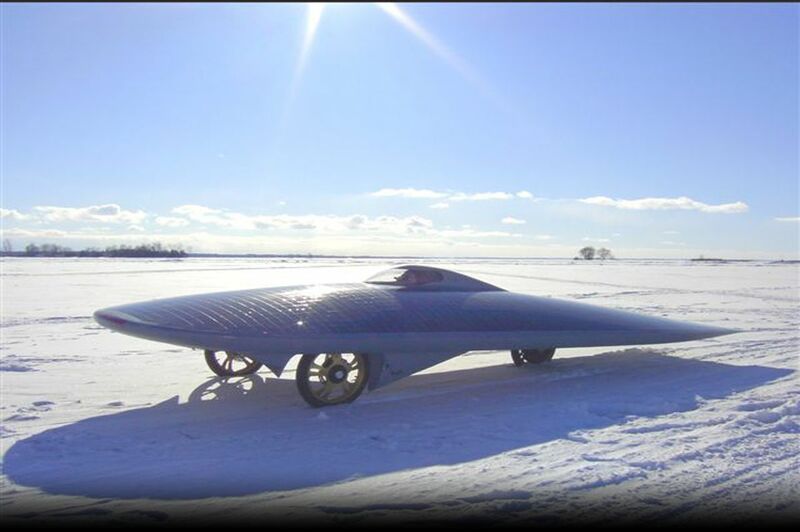 To see the solar car! Solar power flower lights, goodnight!